Using printable sticky notes in the classroom or in piano lessons can give students a tremendous amount of ownership over their own study or practice sessions. Quick, easy, customizable sticky notes work for to-do lists, reminders, practice steps, study steps, scales, solo repertoire, theory, recital prep, and so much more! Students are eager to follow their own handwritten steps, which makes study and practice time more effective and efficient, and the real bonus is that students come to lessons more prepared than ever! 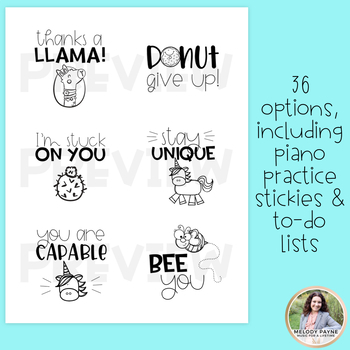 Includes to-do lists, piano practice lists, unicorns, llamas, sloths, tacos, donuts, and more! 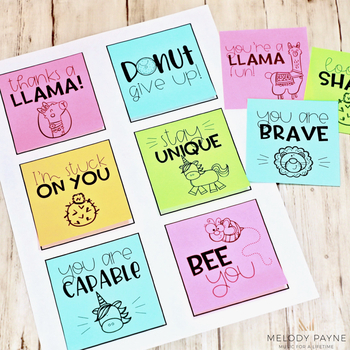 Perfect for encouragement, cute rewards, thank-you's, and for recognizing hard work. Click here to visit my blog and learn how to incorporate this useful and fun tool into your own music teaching. Print the template page. Take note of which direction your paper runs through the printer (the word “top” on the template will help you). Check out the PREVIEW for a peek at the designs. Purchasing this item grants you a SINGLE USER LICENSE for use by a single teacher. Purchase multiple licenses for multiple users at checkout. Not for commercial use. Copyright © 2019 Melody Payne. All rights reserved. 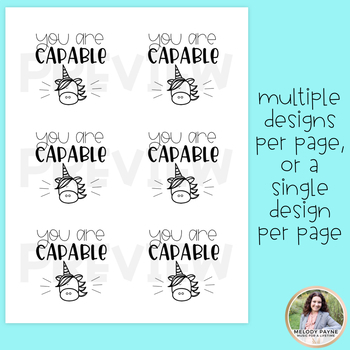 Leaving thoughtful feedback helps you earn TpT credits to spend! I'd love to hear how much you and your students are enjoying these items, and other buyers benefit from reading your feedback, so please leave a few kind words and a super rating below. Click here for music worksheets! Click here for rhythm and note value activities! Click here for music math resources! Click here for llama resources!